Katharine (= "Kathryn") Rosalia Schwert was born on November 9, 1893, and she was baptized by Father Ferdinand Kolb of Saint Boniface R.C. Church in Buffalo on November 12, 1893. Witnesses were Anton and Rosalia (née Sarach) Lorenz. 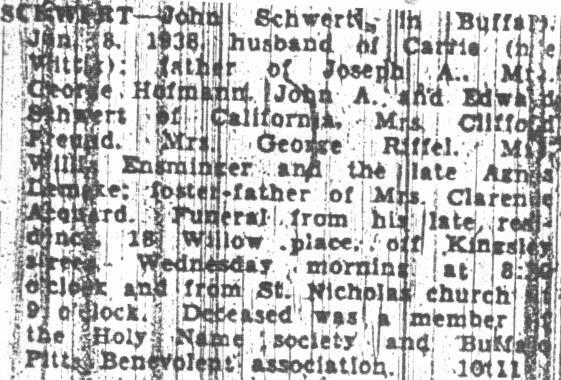 The obituary for Augusta (née Lorenz) Schwert (deceased June 2, 1912) makes reference to Katherine as "Mrs. L. Weigand." Katherine's husband was Leo A. Weigand, who according to his World War I draft registration card, resided with his wife and children at 48 Locust Street in Buffalo. Katharine's baptismal record includes the notation that she and Leo were married at Saint Nicholas R.C. Church on May 15, 1912. Leo was born on July 10, 1891, in Buffalo, and at the time of his draft registration he was employed by the Pierce Arrow Company. The 1920 U.S. Census shows "Katheryn R. " and Leo A. Weigand still residing at 48 Locust Street, along with their two children Katheryn J. and Leo A., Jr. 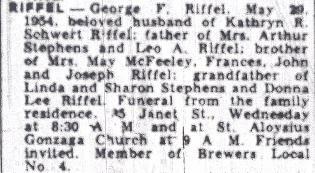 The obituary for Katherine's father (deceased January 8, 1938) makes reference to Katherine as "Mrs. George Riffel." Tracing this back to the 1930 U.S. Census, we find that "Katherine" had by then been divorced from Leo Weigand. The 1930 U.S. Census instead shows that she resided with her two children at 25 Ruspin Avenue in Buffalo, with "George F. Riffel" (age 38) as a "boarder." According to his World War I draft registration record, George Fred Riffel was born on February 9, 1892, in Buffalo. The 1920 U.S. Census shows George married to a "Jessie." After his marriage to Katherine, George apparently adopted her two children, as they both carried the surname "Riffel." George died on May 29, 1954. 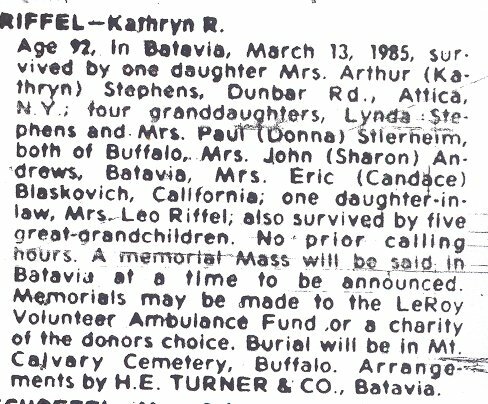 "Kathryn" died in Batavia, NY, on March 13, 1985. Both are interred in Lot 314, Section I, Mount Calvary Cemetery (Pine Hill), Cheektowaga, New York. Regarding Leo A. Weigand, the 1930 U.S. Census shows that he was now married to Isabell A. (presumbably, née Nolan) Weigand, and that couple resided (with Isabell's mother Katharina M. Nolan) at 109 Shepard Avenue in Kenmore, New York. 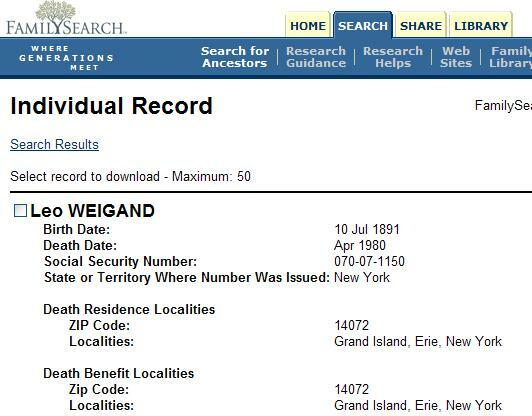 The Social Security Death Index shows that Leo died in April, 1980, and that at the time of his death he was residing on Grand Island (near Buffalo). Kathryn (née Weigand) (Riffel) Stephens: Born 1912; died 1995. Leo A. Riffel: Born 1916; died 1968. 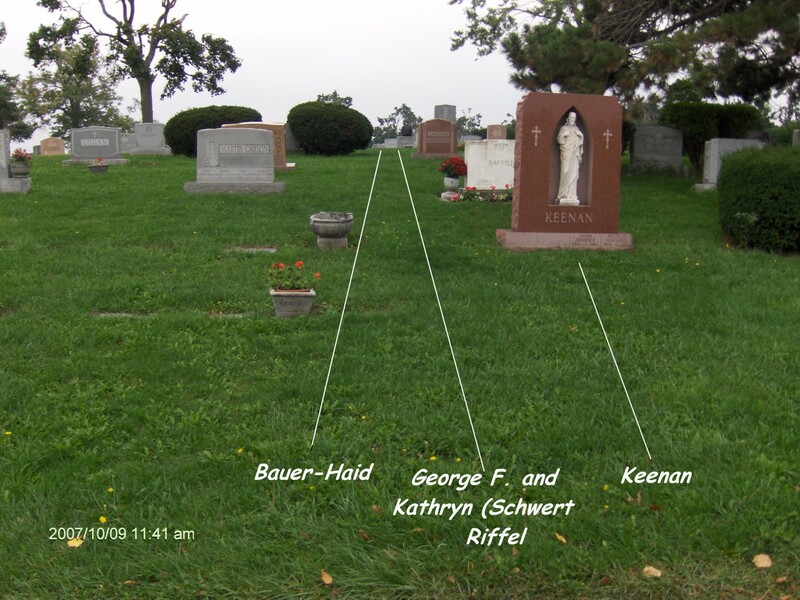 General location of the graves of George and Katherine (= "Kathryn") Riffel. Lot 314, Section I, Mount Calvary Cemetery (Pine Hill), Cheektowaga, NY. 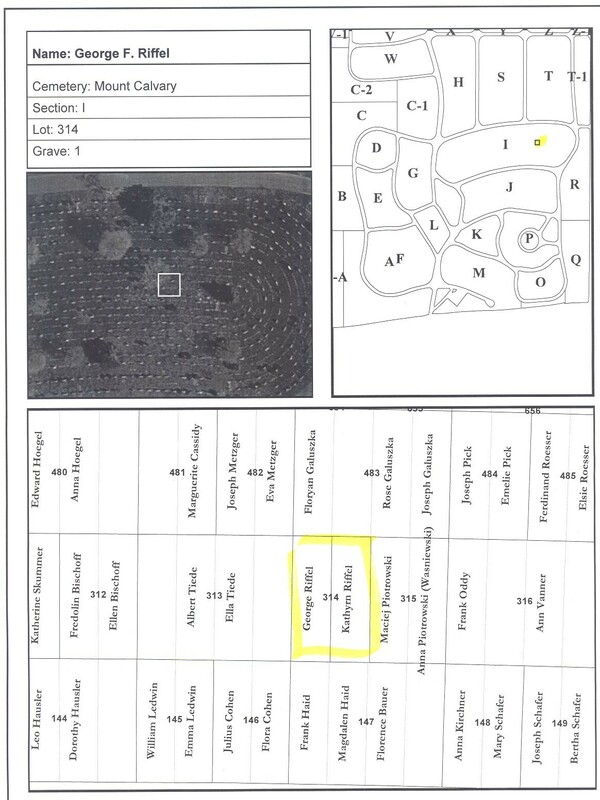 A map to help locate the gravesite is available here. Grave of Katherine (= "Kathryn") Riffel. Lot 314, Section I, Mount Calvary Cemetery (Pine Hill), Cheektowaga, NY. 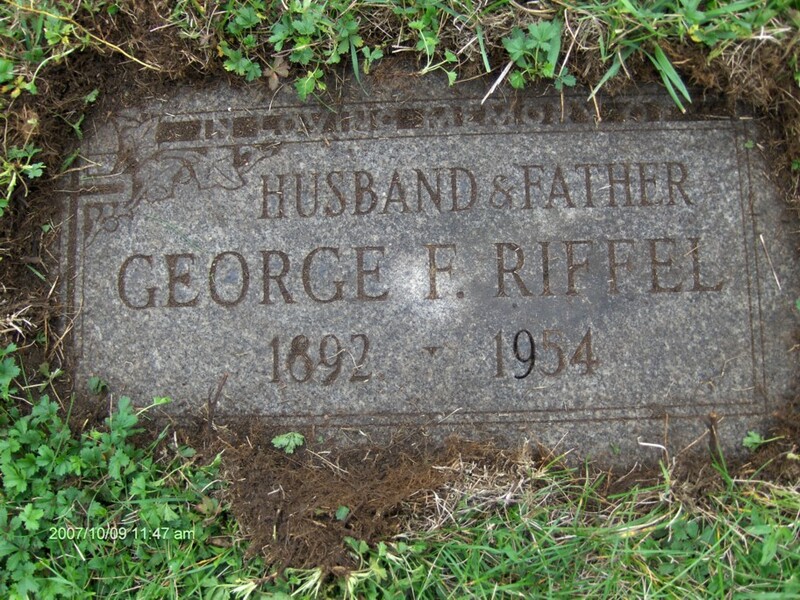 Grave of George F. Riffel. 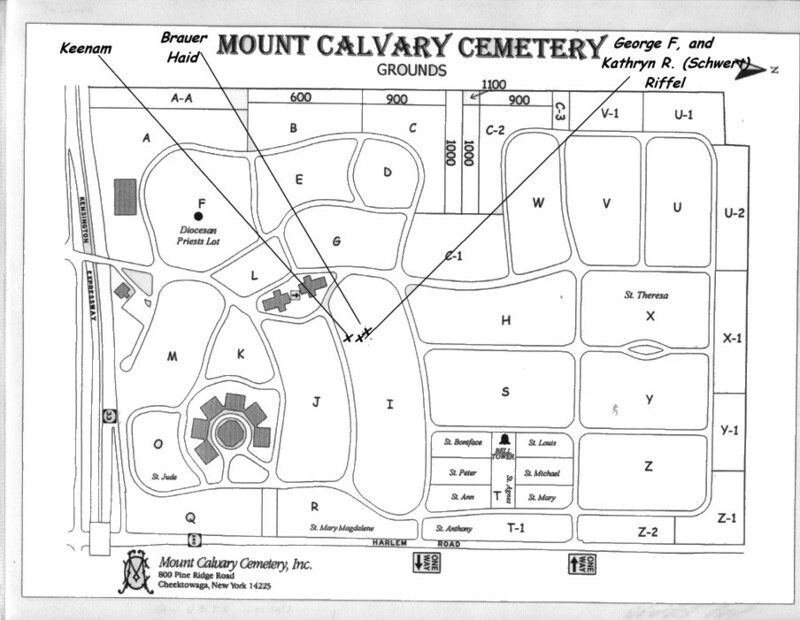 Lot 314, Section I, Mount Calvary Cemetery (Pine Hill), Cheektowaga, NY. Baptism Record: Katharina Rosalia Schwert, born November 9?, 1893; baptized on November 12, 1893 by Father Ferdinand Kolb of St. Boniface R.C. Church, 124 Locust Street, Buffalo, NY. Obituary: George F. Riffel, died May 29, 1954. 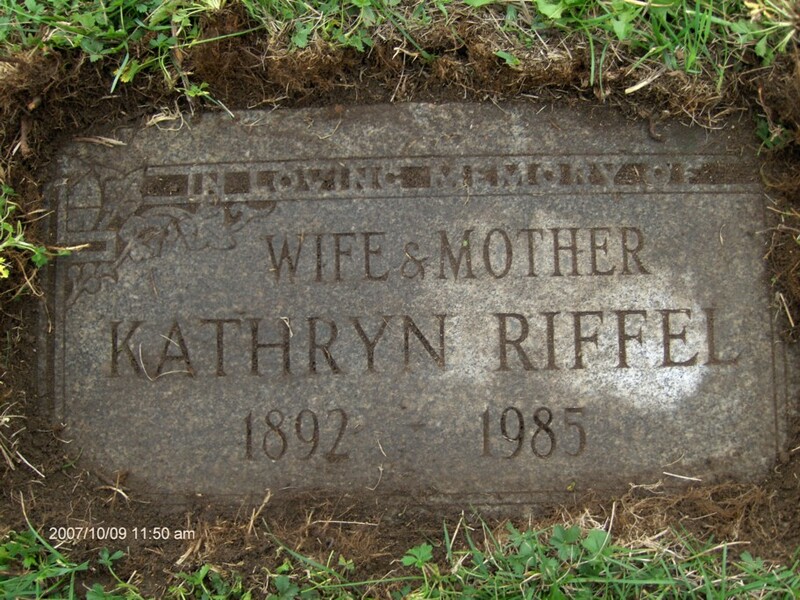 Interment Record: George and Katherine Riffel, Lot 314, Section I, Mount Calvary Cemetery (Pine Hill), Cheektowaga, New York. Social Security Death Index: Leo A. Weigand, born July 10, 1891, died April, 1980. Obituary: Kathryn R. (= "Kathryn") (née Schwert) (Weigand) Riffel, died March 13, 1985.